With the right hand blenders, making lump-free sauces, soups, smoothies, and dips will seem like a piece of cake. Simply insert the device in the soup, smoothie, or dip and turn in on. In addition to smooth consistencies and easy mixing, the right accessory saves you time and energy. But with all kinds of items on the market, which should you go for? This is the question that drove us to review the top 10 best hand blenders in 2019. Although it was a challenge, we managed to pick the best. However, before we begin the countdown, it would be nice if we mentioned the main features. 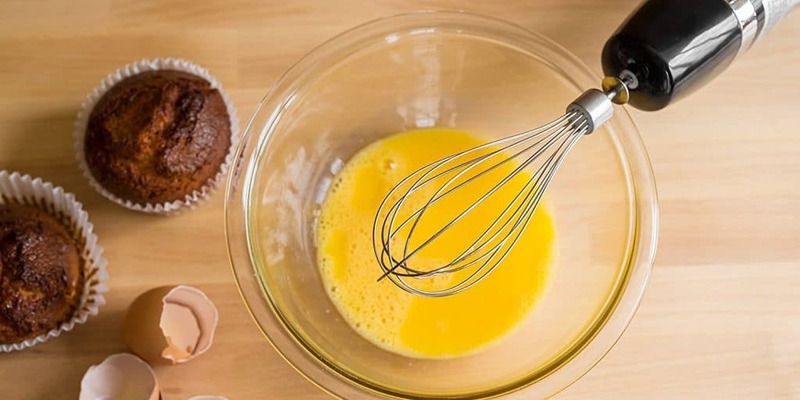 Materials: A good blender comes in a sturdy material for good performance and reliability. Stainless steel and heavy-duty plastic are the common materials. Safety: A good piece is made from materials that resist rust/corrosion, and don’t contain harmful compounds like BPA, phthalates, lead, or PFOA. Cleaning ease: Top choices come in simple and seamless designs for easy clean. The parts will easily detach for better and more hygienic cleaning. Power: The appropriate handheld blender features a powerful motor for fast speed and high performance. For added versatility, the speed will be variable.Other features that also need consideration are Wattage, Ergonomics, Attachments, Speed Controls, Noise, Quality, and Affordability. 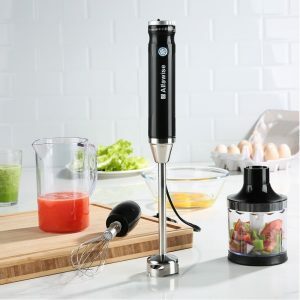 This silver black immersion blender by Alfawise is well known in the market. It features a powerful 350-watt motor for improved service and works together with sturdy stainless steel blades. The unit features an 8-speed control for improved efficiency and has a stick design for easy reach into pitchers, pots, and bowls. Cleaning the blender is very easy because the parts can easily be taken apart. The blender’s positives are easy to use, decent speed, good performance, and nice reach. The negative is that it’s not the most silent. 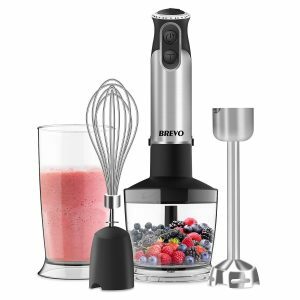 Boasting of a 4-in-1 functionality, the BREVO Immersion blender is perfect for many kitchen-mixing operations. It blends chops, mixes, whisks, purees, crushes, and froths as well. The lightweight and portable device feels light on the hands and delivers good performance thanks to the quality and sturdy stainless steel blades. It’s powered by a 300-watt motor and comes with variable speed control. The simple Click-to-Lock mechanism makes attaching and detaching attachments easy. Key merits of the blender area sturdy construction, powerful motor, good grip, ergonomic, and simple design. The demerit is it’s not suited for heavy-duty operations. The Es Unico is among the fastest immersion blenders in the market. 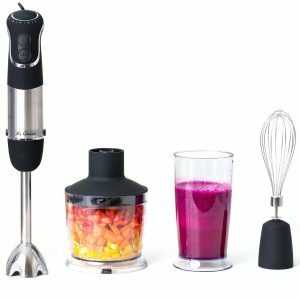 It features a powerful 850-watt motor that makes easy work of soups, baby food, nut butter, smoothies, sauces, gourmet, salad dressing and other food items. For added versatility, it features a 6-speed control that allows you to select the best speed setting. It is made from stainless steel and ABS plastic that resists rust, corrosion and is hygienic. Cleaning the unit is very easy thanks to the Snap & lock design. Advantages of the blender are the powerful motor, fast speed, good quality, and affordability. The main disadvantage is the small size. If you want a powerful and energy-efficient hand blender. Then you should not look further than the Braun MQ725. This stylish and portable blender comes in black and features a simple one-hand operation. It has stainless steel blades for agility, strength, and durability and a soft grip handle for maximum comfort. The Easy Click mechanism ensures the attachments fit nicely for good performance and safety. It has a unique bell-shaped shaft for fast performance and features Smart Speed that increases the speed by just squeezing the unit. The positives are easy to use, simple to clean, good power, and lightweight. The downside is that the safety button isn’t well-placed. Coming in silver color, the All-Clad KZ750D is perfect for mixing a range of items including smoothies, soups, sauces, purees and baby food. It’s mainly made from stainless steel and feels very robust and solid. The device comes with a powerful 600-watt motor and variable speed control. For added control, you can use the turbo settings. It’s easy to clean thanks to the detachable shaft. The blender’s advantages include powerful motor, variable speed, protective stainless-steel guard, and easy to use. Some people say it’s a little heavy compared to other options. 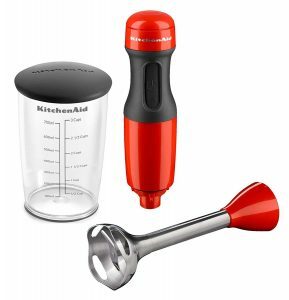 This 2-Speed hand blender by Kitchen Aid comes in a simple and practical design. It will enable you whip food items fast, easily, even in tight places. The KHB123HT comes in a one-handed design for easy operation while the ergonomic handle provides a good grip. The 2-speed setting allows you to choose the desired speed while the removable 8-inch blending arm makes cleaning and storage convenient. It comes with a 3-cup BPA-free plastic blending jar and is available in over 10 colors. Notable advantages include decent speed, ergonomic design, easy to use, practical, and easy to clean. The main downside is that it’s a little noisy. 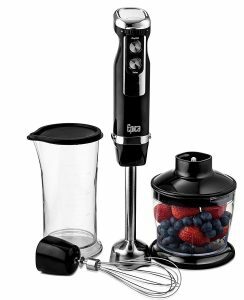 Pureeing, grinding, blending, mixing, chopping, juicing and many more functions is what this elegant handheld blender by Epica is meant to do. The quality piece comes in a 4-in-1 design for improved productivity. It features a 350-watt motor for fast and efficient mixing, one-click design for easy fitting and removal of attachments, and easy-control design for maximum efficiency. For improved performance efficiency, it features a variable speed control. Key merits of the blender are the powerful motor, not very noisy, easy to use, and sturdy construction. The demerits are that the slowest speed still feels a little fast. 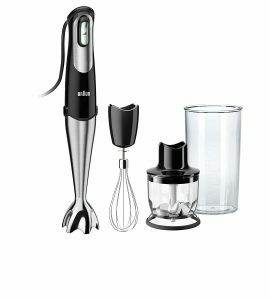 This 3-in-1 immersion blender by Aicok blends, chops, and whisks. It’s constructed from food-grade stainless steel for improved hygiene and safety and comes with a simple designed for improved productivity. The top-grade blades are linked to the powerful 350-watt motor and the speed can be varied to suit the application. It has an ergonomic handle for improved handling, comfort, and safety and a smooth surface for easy cleaning. Its positives are the simple design, easy operation, adjustable speed, ergonomic handle, powerful motor, and good quality. The negative is the loud motor. 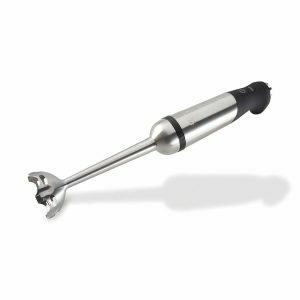 If you want a powerful motor, then KOIOS’ hand blender is a good fit for you. 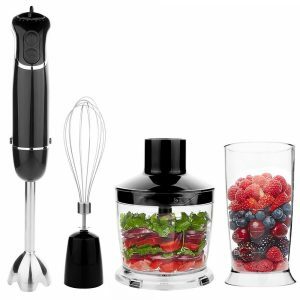 The blender comes with a 600ml beaker, stick blender, egg whisk, and a 500ml food processor. 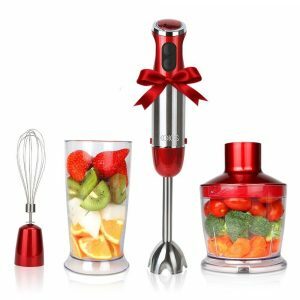 You will be able to take on multiple tasks such as chopping, emulsifying, blending or whipping. To make it more versatile, the company designed the 8″ Blending shaft safe to use with other items. You can use it with deep pots, plastic cups, and mixing bowls. The hand blender has 6-12 Variable Speeds and even comes with a turbo button. The purchase is also backed by a 2-year warranty. This 4-in-1 blender from OXA ranks as one of the best handheld blenders in the market. Just as it looks solid, it also delivers amazing results. The 4-in-1 unit blends, purees, chops, and whips a range of food items. The sturdy cutters together with the 300-watt motor work on grains, vegetables, fruits, soups, sauces and other foods. It looks very elegant thanks to the sleek design and is also easy to use and carry courtesy of its compact and lightweight. In addition to being BPA-free and dishwasher safe, consumers love the powerful motor, simple design, easy to use, and energy-efficient. The only disadvantage is the short power cord. In the above review, we have briefly looked at the best handheld blenders in the market. We have listed them from the best to the very best. In order to compile them, we focused on the main features that include comfort, energy efficiency, ergonomics, versatility, speed, noise, material, and design. This guarantees you of a lump-free and smooth dip, smoothie, sauce, or soup. You also don’t have to worry about space since they have a very small footprint and don’t require lots of space. 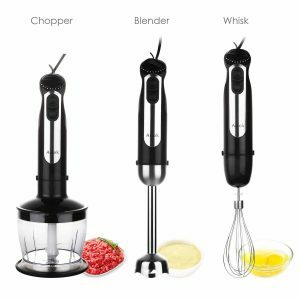 By using the top 10 best hand blenders in 2019 review, you will spend the least amount of time and effort picking the right product.